At the “Orthodoxy in America: Past, Present and Future” conference at St. Vladimir’s Seminary in New York, SOCHA member Matthew Namee presented his paper The Myth of Past Unity, addressing the issue of the character of administrative unity prior to the establishment of the Greek Archdiocese in 1921. 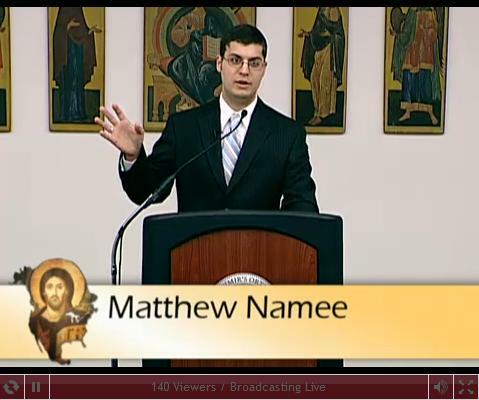 You can listen to the recording of his presentation here (courtesy of Ancient Faith Radio). For anyone interested in the topic of Orthodox administrative unity in America, this paper is must-read (or “must-listen”) material. I watched some of the brief Q&A session that followed, and although there were a couple of criticisms of Matthew’s remarks, the most directly negative of them amounted to a restating of the “myth” that Matthew identified without offering counter-evidence. Another commented that there had been a single hierarchy in America, but that essentially begs its own question (i.e., does appointing a bishop for Alaska really give Russia control over a whole continent?) and misses Matthew’s actual assertion (i.e., no matter what may have been “officially” the case, the reality on the ground was clear disunity). Even if one accepts the focus-shift required by the “single hierarchy” comments, that still leaves the embarrassing problem of the Russian-American hierarchy’s lack of actual claim over well over 100 non-Russian parishes in its own published lists. That is, it represents an anachronistic reading of history. Update: Mark Stokoe (of OCANews.org) offers some commentary on Matthew’s lecture. And here’s a bit more from Lydia Berzonsky.